I swear, this is the longest post ever. I got the mail today (which isn't actually spectacular, I usually get it) and noticed an envelope addressed to me in my own hand writing, no return address. Which is a good sign it was from a magazine I submitted a story to. And even better, it was thick. When I was applying to colleges, a thick letter was good. It meant you got accepted and there was all this paperwork about housing and learning communities, and how to register online. I figured, thick envelope, that's a first. Contract? So of course I had to rip it open standing in the driveway next to my lopsided car. But apparently magazines don't work like universities. A thick envelope just means they were kind enough to send you back the first five pages of my stories. As to where the rest of it is, I have no idea. I'm assuming they tossed it, and so I'm quite confused as to why the rest of my story didn't get tossed too. But my biggest disappointment is that this market is well known for their rejection letters, so I expected something clever/funny. It was just an ordinary 'no thank you' note, but it was handwritten. That was nice. Today however, is not a bust, because it is Halloween! 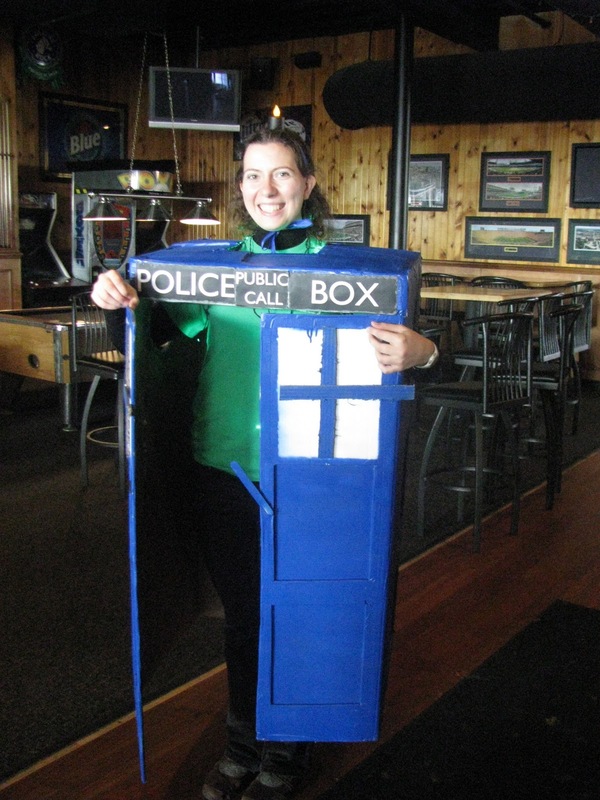 Me, as the TARDIS from Doctor Who, at my NaNo region's Kick-Off Party on Friday. So, I have to share 7 things about me. I sit so close to the wheel when driving, if I flip down the visor my hand brushes my forehead. I'm a Transfomers fan. I can't say I grew up with the original cartoons as they aired before I was born, but I did grow up watching the reruns of them. I have this thing...with chocolate...I can't say no. If it's in the room, it'll be gone momentarily. I have made a book by hand. I'm talking sewing the binding as well as writing and drawing with calligraphy pens. I'd post a picture, but it's on my missing harddrive. I love music. And hate silence. I always have to have some on in the background. My stupid human talent is that I can suction cup to floors. It's a side effect of really flat feet. And no, I can't walk on walls. Though I've tried. And, while I'm slightly embarrassed to admit it, I got into writing seriously through fanfiction. Righto, next step is to introduce you all to new bloggers! 15 actually. And it's at this point I realize that my writing circle is, well, really small. 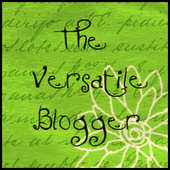 I might not actually have 15 bloggers to introduce you to, especially after removing bloggers that Linda, Annalisa, and I all share in our circles that have recently been award it. I really need to expand. Jeannie from A Book, A Girl, A Journey - someone I discovered thanks to the Killer Character Blogfest. She's got great interviews and a wonderful sense of character. Emily at Get Busy Writing - she always writes fantastic blog posts, and her Killer Character Blogfest was so much fun! Patricia at Journey Through the Pages - She's chronicling her adventures in self-publishing, and has recently also opened for business creating book trailers. Guilie at Quiet Laughter - I discovered her through the Killer Character Blogfest, and I love how she's not afraid to show off her writing. She's got a great thing going on with her six sentence Sundays. Keri at Quill Cafe - I've known her for about a year now, thanks to NaNo. 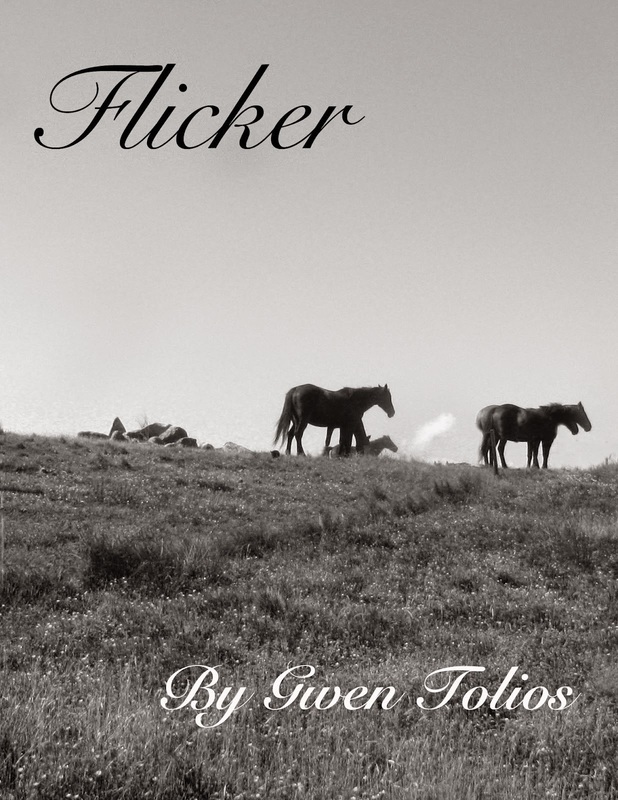 She's always got great book reviews and talks of things writerly on her site. Alright you guys, your turn to tell us about yourselves and pass the award on to 15 others. So I missed the 15 blog mark myself. Here's a few random selections then you might like. Jenny at The Bloggess - if I had a blogging role model, it would be her hands down. Funny, living life in a crazy way, and struggling with her issues, I totally want to be like her. Sarah's The Phoenix Requiem - Sarah has a couple of completed web comics, with this being the most recent completed one. The art and story line are simply amazing. Tina at Fantastic Book Review - She's on hitaus because offline life caught up with her, but she has wonderful, frequent reviews of YA fantasy. There you go. Now, heads up you most likely won't be seeing too much of me, both on your own sites making comments and here posting. That's because the monster known as NaNoWriMo will have taken over my life, just to let you guys know. To my fellow WriMos, I wish you luck! Sorry to hear about your rejection. But thick envelopes aren't always bad - I once got an acceptance by receiving the mag I was published in through the post - so always open envelopes with excitement, because you never know! @Annalisa - I try to open all envelopes with a bit of hope, this one just instilled more than the rest. @Jennie - so sorry about that! And I'm glad you weren't too overwhelmed by my word spew-age.